Next week's inauguration marks a historic change in U.S. policy. Here's why. On May 14, 1948, as the Jews of Palestine declared the establishment of a Jewish state, called Israel, U.S. President Harry Truman granted immediate recognition on behalf of the United States, becoming the first head of state to do so. On May 14, 2018, 70 years later, President Donald Trump will move U.S. Embassy operations to Jerusalem from Tel Aviv, where it has been since 1966. After Trump’s contentious decision last year to recognize Jerusalem as the Israeli capital, the official U.S. Embassy inauguration Monday will coincide with the 70th anniversary of Israel’s Declaration of Independence. It will be a momentous, though divisive, occasion. What’s so controversial about moving the U.S. Embassy to Jerusalem? 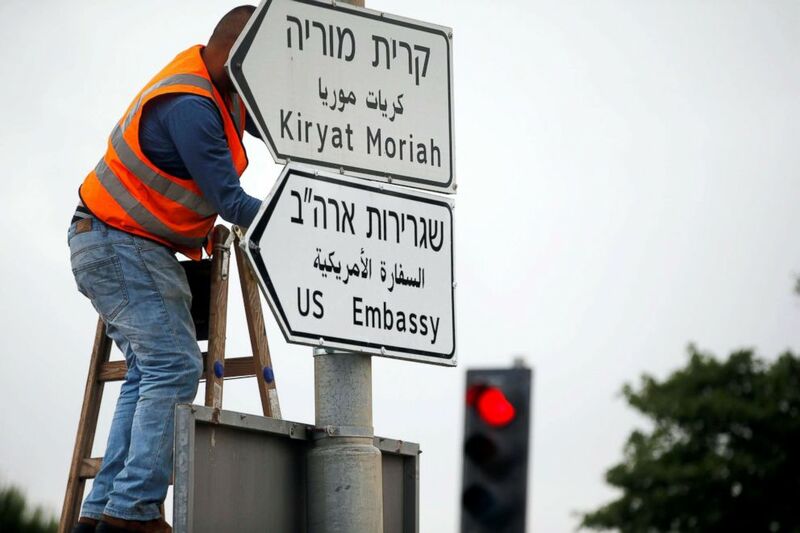 (Ronen Zvulun/Reuters) A worker hangs a road sign directing to the U.S. embassy, in the area of the U.S. consulate in Jerusalem, May 7, 2018. During the first Arab-Israeli conflict in 1948, Israel captured Arab territory beyond the U.N.-mandated partition plan of 1947. The 1949 Armistice Line, aka Green Line, has largely set the international parameters for the borders between Israel and the Palestinians. But the status of Jerusalem is complicated. 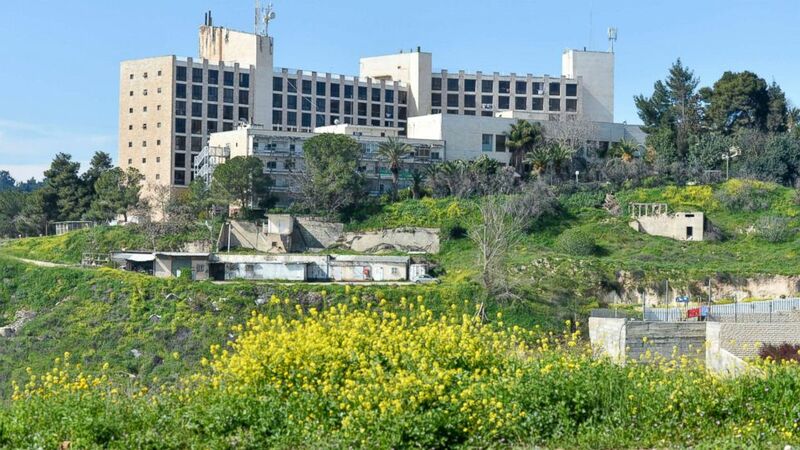 (Artur Widak/NurPhoto//Sipa USA via AP) A general view of the former Diplomat Hotel, now part of the U.S. consular compound in Arnona area of Jerusalem, built on disputed territory, March 13, 2018, in Jerusalem. The compound will serve as the American Embassy until a permanent site is found. After the 1967 Arab-Israeli War, the lines were drawn again, and Palestinian territory was marked as Gaza, the West Bank and East Jerusalem. The Palestinians recognize East Jerusalem as their capital. So why has the U.S. Embassy always been in Tel Aviv? 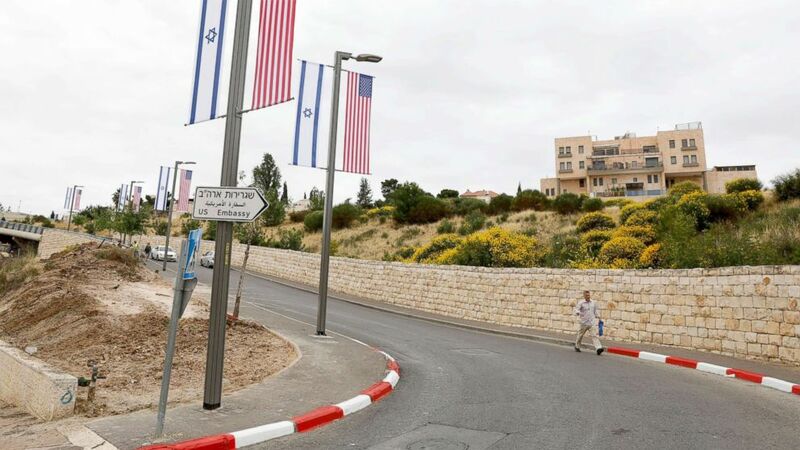 (Abir Sultan/EPA via Shutterstock) A new road sign and flags are placed at the road leading to the U.S. consulate in the Jewish neighborhood of Arnona on the East-West Jerusalem line in Jerusalem, May 8, 2018. The United States and most countries with diplomatic relations with Israel have always kept their embassies in Tel Aviv to avoid pre-empting any final decision on the status of Jerusalem negotiated between Israelis and Palestinians. Withholding official recognition has also been perceived as a way to promote talks between the two sides, largely moribund since 2014 when Palestinian President Mahmoud Abbas signed a treaty to join the International Criminal Court after the U.N. Security Council rejected a Palestinian-drafted statehood resolution that demanded the withdrawal of Israeli forces from the West Bank within three years. Although the Israeli parliament, known as the Knesset, the Supreme Court and most other government buildings are located in Jerusalem, the Defense Ministry and the Israel Defense Forces are in the HaKirya section of Tel Aviv. (Thomas Coex/AFP/Getty Images) A partial view taken on April 30, 2018 shows excavators working near the U.S. consulate situated in the no man's land between West and East Jerusalem, which will be used as a temporary new U.S. Embassy starting from May 14, 2018. 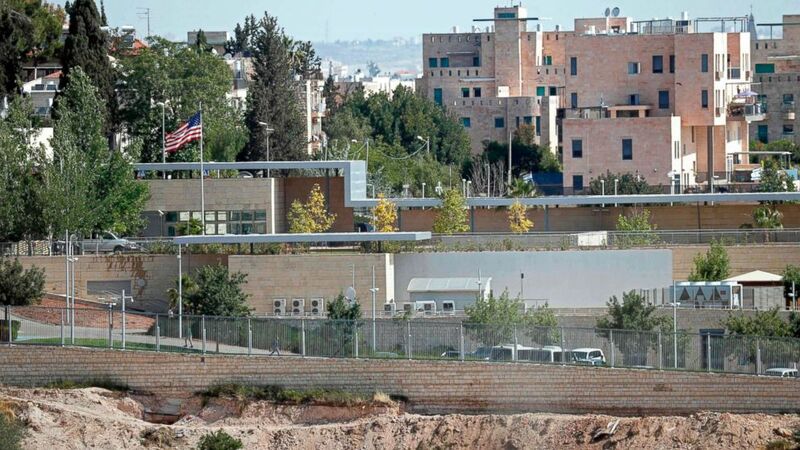 The United States does maintain a consulate general in Jerusalem, which is responsible for relations with the Palestinians and the Palestinian Authority. While the United States plans eventually to build an entirely new embassy building in Jerusalem, Monday’s largely symbolic move will send the ambassador’s office and about 50 staff members, including consular officers, to a separate, already existing U.S. facility in Jerusalem that has handled passport renewals for Americans and visa applications for local residents. The compound straddles the armistice lines and is partially located in no-man’s land that falls between West and East Jerusalem. 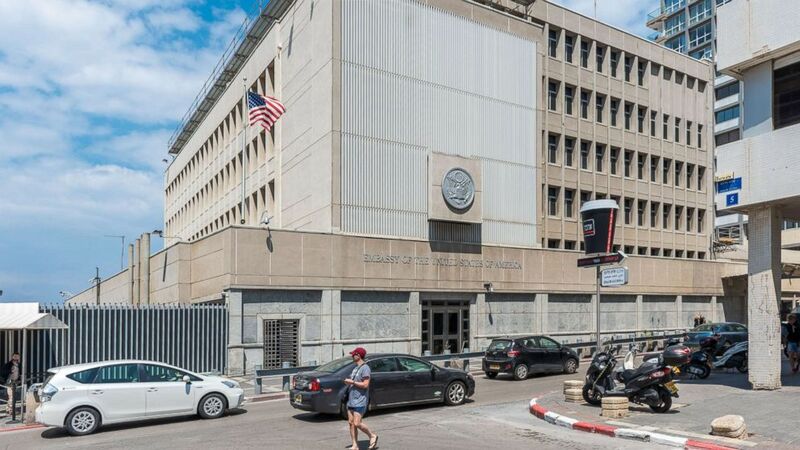 (Michael Jacobs/Corbis/Getty Images, FILE) The U.S. Embassy in Tel-Aviv, Israel is seen in this file photo, April 14, 2017. Aside from moving the ambassador and his staff, the change is largely unseen, except for the installation of a new plaque on the building wall and more discreet modifications and security amendments. It is a commemoration of the mass displacement of Palestinians who fled or were expelled after the Israeli Declaration of Independence in 1948. Israel maintains that Palestinians left Israel of their own accord or for their own safety, but some Israeli historians admit a “handful” of expulsions had occurred. As with much of the conflict, both sides dispute the other's record of historical events. The sensitivity of the day and the U.S. relocation has led many people to expect an uptick in protests by Palestinians angered at American recognition of Jerusalem as the capital of Israel. The Trump administration has stressed that the relocation does not pre-empt decisions on the final status of Israel, hinting that East Jerusalem may yet be the capital of a future Palestinian state. But with this move seen as a boon to the Israelis, some people question what motive is left for the Palestinians to re-engage in talks, particularly with the United States as a mediator.